What is Klarna? Klarna is a leading alternative payment provider. Klarna’s vision is to make all payments ‘smoooth’, adding value for shoppers and retailers with unique payment options and superior customer experience. Klarna has 2,000 employees across 14 markets, and is leading the way for alternative payments by serving 60 million consumers and 100,000 merchants smoooth payment solutions. Learn more. What is Slice It? 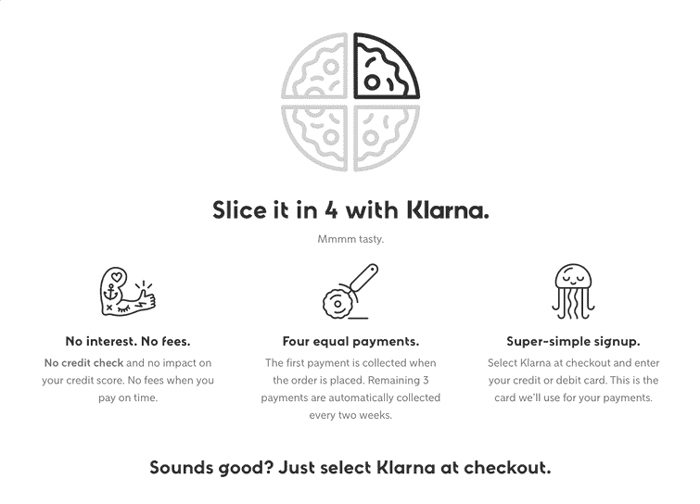 Slice it is Klarna’s pay over time financing option, which is offered at the time of checkout. This affordable and highly flexible open-end line of credit is issued by WebBank (FDIC) in partnership with Klarna, and it allows you to pay for your purchases over time. View complete terms.